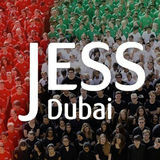 Welcome to JESS Dubai! Thank you for joining our team, we look forward to working with you. This guide is intended to give you an idea of some of the fundamentals of how we work and the systems we work with. Please report any site related issues to the Facilities team. They have a helpdesk which can be contacted at facilities@jess.sch.ae Please ensure that Facilties are â&#x20AC;&#x2DC;invitedâ&#x20AC;&#x2122; to any activity around the school which you may be planning and will require any set up of tables/ chairs or gates opened or closed. IT - Who should you see for what? Technical Issues (Hardware / Software failure) For any IT technical problems (hardware / software failure) you should send a request via e-mail to the IT Helpdesk (helpdesk@jess.sch.ae). Do not call the technicians on their personal mobile numbers or go to the helpdesk unless it is absolutely vital. Note: If your e-mail is not working then you may call or visit the helpdesk directly. Categorise your helpdesk request with the ‘Level of Impact’ in accordance with the table below. This helps the technicians to prioritise the most urgent requests. Network Security & Integrity Passwords This is fundamentally the only way you can ensure no-one has access to your personal area. All users are prompted at their very first logon to change their password. It is important you change your password from the default password to something more secure. Passwords must be a minimum of 8 characters and should contain a mix of letters and numbers. You will be required and prompted to change your password at least once a term. Virus protection software The school runs Symantec Anti-Virus software which automatically checks for viruses on external devices plugged into the network. Staff are asked to be vigilant when transferring information between home and school. Please ensure your home computer has anti-virus software if you are using it for work that will be transferred to school. Please see the IT Services department for further information if you are unsure how to install anti-virus software. Note: If your memory stick / external hard drive does not open as expected through My Computer try right click, explore to open. Internet filtering For those new to Dubai, the internet filtering provided by the service provider in the UAE is very high in comparison to those in other countries. As a result you may find you do not have access to some pages you might normally have access to in other countries eg. The National Lottery â&#x20AC;&#x201C; which might be used for probability in Mathematics is banned as it is associated with gambling which is illegal in the UAE. If you have problems accessing any web pages, please send a request via e-mail to the IT Helpdesk (IT Services) as it maybe that the website is available in the UAE but just blocked inside school by the monitoring software. Saving Files All areas of the school are now working predominantly from sharepoint sites to enable collaborative working and you will have been allocated access to the relevant areas for your role. SharePoint: Access to SharePoint is via a web browser and the URL http://mail.jess.sch.ae You can access SharePoint by clicking the SharePoint icon on your dashboard. 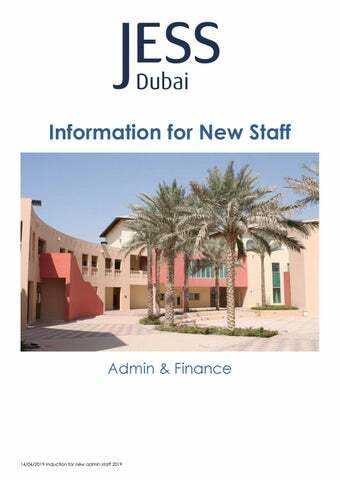 One of the most useful sections to access on SharePoint for new staff is the JESS Staff Handbook shown below. This can be accessed via the Admin site on SharePoint. Note: It is advisable to setup a folder structure to keep your information organised on ONE DRIVE just as you would on your local storage drive, a flash drive or your home computer. Planning for Trips and Events In addition to the Staff Handbook you should familiarise yourself with the Internal Events planning page (accessed via the staff handbook). These pages contain helpful information for booking/planning events. and the External Conferences, Trips and Events page. Select the MAIL icon to access your school e-mail. If Yes, who & how many? Refreshments please specify Tea, coffee and water please set up on table at back end of venue. Laptop 2 microphones Projector extension lead Sound system for back up music Please ensure a technician is available prior to start and throughout event. If you do not have permissions for booking a room please check with the relevant school PA who should be able to make a booking for you. The School Website The school website contains general information on all three JESS Schools and can be accessed via www.jess.sch.ae. The external school website is maintained and managed on a daily basis by the Marketing Department. Once you have downloaded the app you will need the school code which is JDXB Then enter the same username and password that you use to access the Parent Portal. If you can’t remember your username, please email parentportal@jess.sch.ae). If you can’t remember your password, use the ‘I have forgotten my password’ link from the log-in page. N.B. You use the same username and password for both the portal and the app. Remember that your username will be an email address. 'Documents & Files' area of the portal under 'General Information / Parent Communication'. are selected. Select ‘authorise event’ to publish immediately to calendars you authorise. Select ‘Finish’ to finalise entry. To update or delete a calendar entry, select ‘edit’ or ‘delete’. To import calendar events from an Excel spreadsheet, select ‘Import’. Choose file, name import and authorise. instance. Once uploaded, edit entries individually to publish to additional calendars. Shared email templates in iSAMs Shared email templates are a very efficient way of communicating with parents and groups of students. To ensure we manage the list of shared templates efficiently please use the following categories when creating a new shared template: a. PRI – at the start of any primary only templates b. JUM – at the start of any Jumeirah templates c. SEC – at the start of secondary only templates and d. SIX – at the start of 6th templates e. DEB – at the start of any debenture related templates f. HEALTH - at the start of any Health Office templates g. GOV – for any Ministry /PSC / KHDA related templates h. ADM – for anything admissions related i. OTH – for anything else. If a template is only used by one person please save this to your own Email templates rather than the shared and delete templates that are no longer required. When you need to contact the group you go into pupil manager and select Custom Groups. You can then select your trip group and send them all an email using the email wizard. Links to other systems: School Interviews Is used for booking parents evenings, school clubs and school tours. Each PA/ Administrator manages their own account with the receptionists managing the school tours. The login page is: https://www.schoolinterviews.co.uk/login?z=bdiy6E You will then need a separate username and password for each instance. Access Control At Arabian Ranches Staff have access throughout the site by tapping their JESS ID card on the access control points. These are located: • Main reception • Car Park entry doors (and the car park barrier) • Student entry point at Gate 2 • Field entry point at Gate 5 • Turnstile by the shopping centre(Gate 7) • Rear door to admin block • Oasis Door in admin block • Third Floor of admin block • English office There are a few rooms controlled by separate access arrangements and IT will be able to give you access to these areas if required eg: Lecture theatre, ICT rooms. Printing / Photocopying / Scanning Printing is managed by the Administration department and all staff are issued with a staff card which is used for accessing the printers / photocopiers / scanners. HR should provide you with this card. Secure printing is available which means the printout will not be released until you release the job using your card at one of the printers around the school. The main printers are located in the reprographics room and in the ICT corridor. The printers can also be used to scan in documents. Instructions on how to scan are located at the printers. Note: Please send large printouts to the reprographics room, as these machines are the heavy-duty printers. Login using your jess email and pasting your temporary password, then create a new password; your new password must be 8-20 characters in length, please use at least one capital letter, and at least 1 number or special character. You need to check your details and add a few more. Run Entro watch report for Sixth Form OFF site Ian to check if missing any sixth form students who may be off site. Finance Most of the forms you might need (or might need to direct teaching staff to) are available on the staff handbook page of sharepoint. The dates for submission of petty cash claims, supply payments etc are issued by finance at the start of each academic year and are published on the finance page of sharepoint. Please make sure that you are aware of these deadlines at the start of the year. Timeframes you should be aware of for finance. Salary is due on the last day of each month but usually paid a bit earlier. Payments are made by direct bank transfer. Petty cash is usually paid towards the middle of the month for claims correctly authorised and submitted to finance ahead of the published deadlines. Supply salaries are paid at the end of the month by separate bank transfer. Payments are completed once a week, usually on a Tuesday. To be included in the payment run invoices must be signed off by the appropriate Head Teacher and submitted to Finance by the end of the preceding Sunday. Outside Hire of JESS sites Both JESS sites are hired out to companies and groups after school. This process is managed by the Site Administrator.